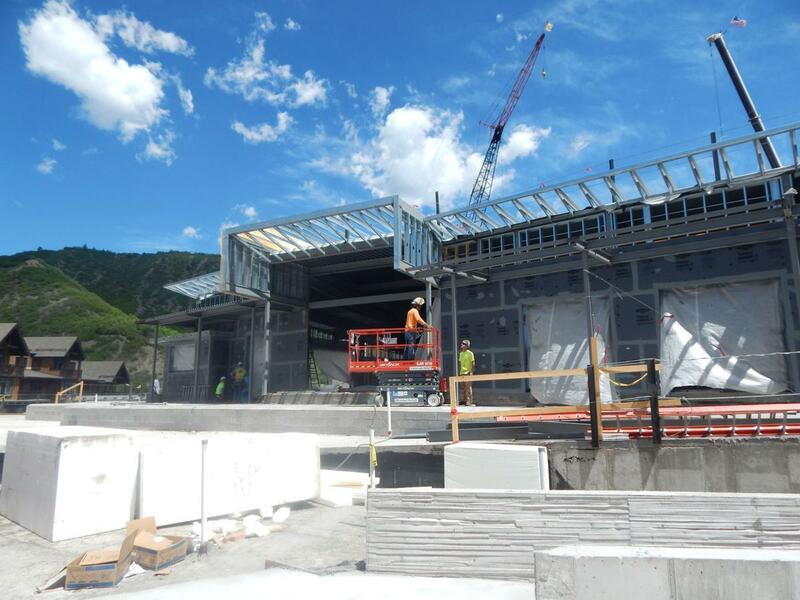 With about six months to go until the next Base Village phase will have its grand opening, the heat is on to substantially complete three new buildings and an events plaza at the entrance to Snowmass ski area. On an unusually warm early June day this week, about 200 contractors, electricians and other skilled laborers from R.A. Nelson sawed and schlepped and hammered away on the 99-room Limelight hotel and Lumin mixed-use building, which could host guests by early 2019, if not sooner, according to a spokesman. Building 6, which will be operated by the Base Village ownership group and include a cafe and a section reserved for a town-operated ice age museum, is also taking shape but is further behind its companion buildings that surround the concrete plaza. The plastic wrap and barriers that once masked this Base Village restart now cast aside, the final lap for this phase is rising in plain view of the public, who grew accustomed to exposed rebar and an incomplete site for the better part of a decade. That ignoble period of Base Village history when Related Cos. controlled the project is buried beneath today’s cacophony of construction. “The schedule is definitely tight but achievable,” said Andy Gunion, who is managing the Snowmass Base Village project for East West Partners, which owns the development with Aspen Skiing Co. and KSL Capital. That’s if no major construction issues arise between now and year’s end. The development has benefitted from 2018’s dry weather which helped keep the project on pace, Gunion said. As per the town ordinance tied to the original Base Village approval, these three buildings and the plaza need to be substantially complete by Nov. 1, 2018. “Rest assured, there will be punch list work” after that date, Gunion said this week during a walk-through of the project which showed different levels of progress. According to SkiCo spokesman Jeff Hanle, the Limelight Snowmass is currently “taking reservations from Jan. 4 onward.” The property’s general manager is Lindsay Cagley, Hanle confirmed Thursday. Artists employed by the Boulder firm Eldorado Walls have been working on the climbing wall that’s been built into a side of the Limelight. One of the three lanes climbs the entire five stories of the hotel, and there’s another climbing lane tailored to be more family friendly, according to Gunion. Inside the hotel, the public spaces on the main floor are among the project’s least complete. The installed pizza oven located in the corner almost seems out of place amid the construction disarray. 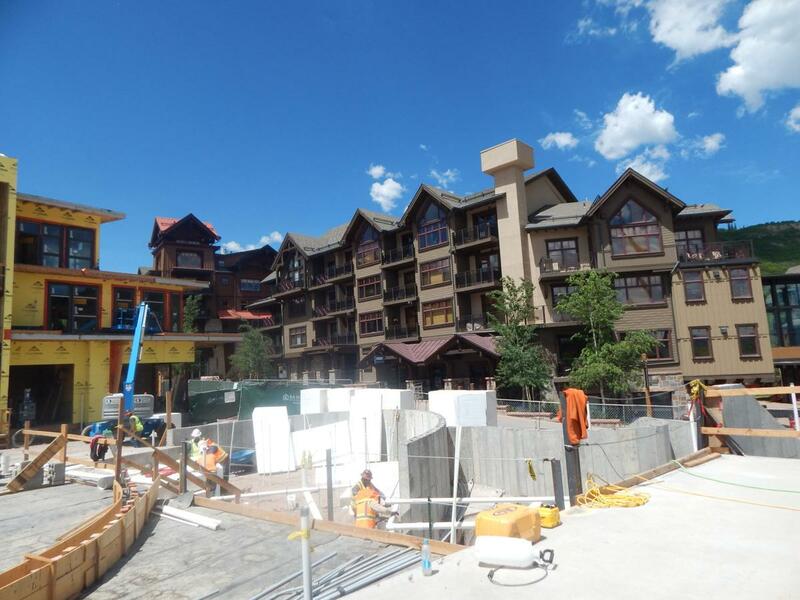 The private Snowmass Mountain Club and the ski valet will inhabit another section of the ground floor space. Gunion pointed out where live music will have its place and spaces for people to gather around the fireplaces beginning this winter. Nearby will be an area where kids will have some kind of game room, though Gunion said that programming will be coordinated with what’s planned for Building 6 so there’s no duplication. 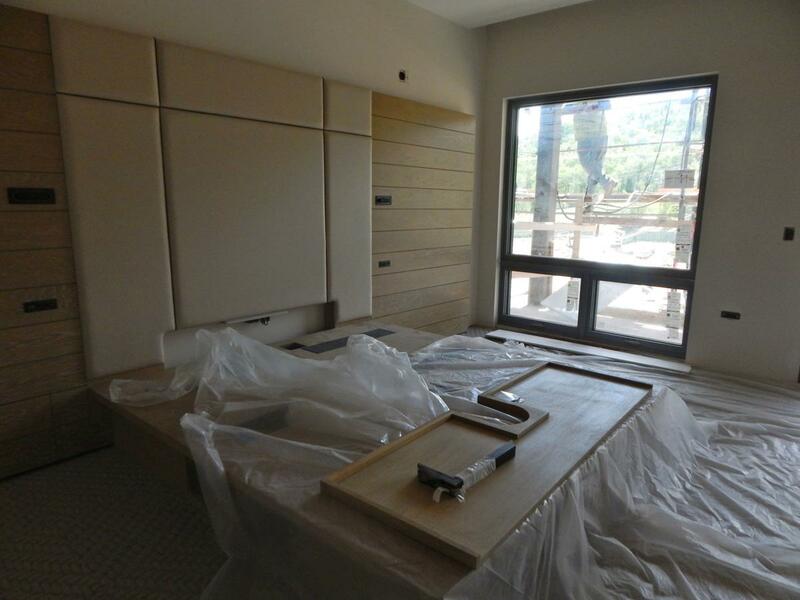 The guest rooms upstairs are similar in size to the Aspen Limelight and in some cases, complete. Penthouse unit No. 517, looks up to Hanging Valley Wall and is one of 11 ownership condominiums that are part of the development. Six are already sold, Gunion said. 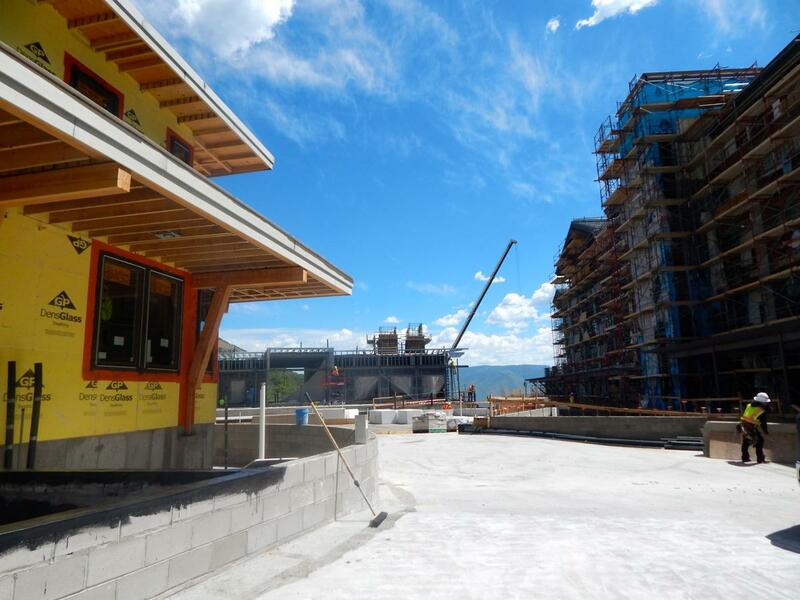 The Base Village skyline view this week included four construction cranes and there have been wisecracks among locals that the crane is Snowmass’ favorite summer bird. A crane also flew over the Snowmass Water and Sanitation District project this week, chief building official Mark Kittle confirmed. Four Mountain Sports will use the ground floor space in the Lumin building, which sits aside the Limelight and features three luxury condominiums, including a penthouse with windows toward the Cirque and Mount Daly. Gunion said the Base Village owners were looking for an operator to run a small creperie and gelato shop in the corner of the building that spills onto the plaza. Building 6 — one-quarter of which will be dedicated to an ice age discovery center that will be under the direction of the building’s landlord, the town of Snowmass Village — will also have a food and beverage component, whose operator also is to be determined. Gunion said the partnership will consider different concepts from local business owners, as the overall restaurant mix in Base Village is still evolving. Behind Building 6 another crane was flying this week on the entry building that will also house condominiums and is part of the next phase of development called One Snowmass. Haselden Construction crews are working on those buildings that abut Wood Road and are targeted for completion in 2019. Osberger is a Contributing Editor for Aspen Daily News. She can be reached at madski@aspendailynews.com or on Twitter @Madski99.